Everything you need to know about this weekend’s UFC 196 fight between Holly Holm and Miesha Tate. When the head kick landed flush on that November night in Australia and sent Ronda Rousey and her aura of invincibility crashing to the canvas, Holly Holm’s jubilation was palpable. The second-happiest person on the face of the earth at that moment might have been Miesha Tate. Yes, that was supposed to be her fighting Rousey that night, so perhaps there was a bittersweet taste to the stunning fall of the most dominant fighter in mixed martial arts. But the sweetness of it all just had to leave Tate tingly. First, she surely took pleasure in seeing “Rowdy Ronda,” her archenemy, get her comeuppance. And even purely in self-reflection, Tate couldn’t help but recognize that in the long view, this result put her back in the game. ), it will be just her fourth fight in the behemoth promotion. The 34-year-old from Albuquerque has nearly 50 pro bouts to her credit, though, between MMA, boxing, and kickboxing, and is a multi-time former world champion boxer. She is No. 10 in the SI.com pound-for-pound rankings. Tate, a 29-year-old out of Tacoma, Wash., challenged for the UFC belt once before, taking Rousey to the third round before losing via armbar back in 2013. It was her second go at Rousey, the first coming when Tate was the queen of 135-pound females as Strikeforce champ, in the days when there were no women’s divisions in the UFC. Even with those two defeats, Tate has a record of 17-5, and ranks No. 4 among female welterweights in the SI.com tally. In addition to the pay-per-view telecast of Saturday night’s five-fight main card—which is headlined by a welterweight bout between featherweight champ Conor McGregor and late-replacement opponent Nate Diaz—four prelims will be shown on Fox Sports 1, starting at 8 p.m. ET, and the event’s first three bouts will be available on the UFC Fight Pass online service at 6:30. Last July, minutes after Tate dispatched Jessica Eye for her fourth straight victory, UFC president Dana White was interviewed on network television and proclaimed that she was now next in line to challenge Rousey. twice, and lost both times. Promoters don’t consider “Been There, Done That” to be a catchy fight-hype slogan. And if the snubbing happened once to Tate, it could happen again. But now there is a new boss in the UFC women’s bantamweight division, one whom Tate has never faced. So once it became clear that a Holm vs. Rousey rematch wasn’t happening anytime soon, it was time to look for the next woman up. That was Miesha Tate. Albuquerque, N.M. BIRTHPLACE Tacoma, Wash.
Albuquerque, N.M. FIGHTING OUT OF Las Vegas, Nev.
100: Percentage of success on takedown attempts and also takedowns defended. Putting these perfect numbers in perspective: Holm has only three UFC fights, and has attempted only two takedowns and had to defend just six. 3: Takedowns by Tate, on 15 attempts, during the four-fight win streak that earned her a title shot. She’s in relentless pursuit of the ground game, though not so successful. 41: Professional fights for Holm prior to coming to MMA (39 boxing, 3 kickboxing). 13: MMA fights on Tate’s resume by the time Holm made her debut in 2011. 3: Championship fight appearances by Tate, between her time in the UFC and a stint with Strikeforce. Holm showed off her championship-level boxing in the fight with Rousey, but what allowed her to do that was some championship-level grappling. It would be a stretch to say she was a better grappler than “Rowdy Ronda,” but she remained disciplined and determined in the face of potential danger, never allowing the then-champ to get in her comfort zone. was. Or at least she’ll likely be better able to set aside ego and stay away from going straight at Holm’s strength. Tate likes to make her fights messy, with scrambles breeding positional mayhem. If she finds herself in a trouble spot, she is good at changing positions. Holm showed the same ability against Rousey, so we could be in for a fight that takes place both on the feet and on the canvas, with each woman testing the waters, perhaps again and again. Holm is the better striker here, Tate the better grappler. The winner will be the one who more successfully fends off her opponent’s strengths, adjusts to circumstances that slip out of her control, and ultimately establishes where the fight is to be fought. Holm is the favorite, with a money line ranging from -330 (bet $330 to win $100) to -420 (bet $420 to win $100) at various sportsbooks. The line on Cruz ranges from +250 (bet $100 to win $250) to +309 (bet $100 to win $309). Don’t do the math. Just because Holly Holm handled Ronda Rousey, who twice handled Miesha Tate, that doesn’t mean Holm has a handle on Tate. This is a whole different fight. Tate is adept wherever the fight might go, though not spectacular anywhere, and if she can avoid needlessly putting herself in Holm’s wheelhouse, she will pose problems. She might even walk away with the belt. 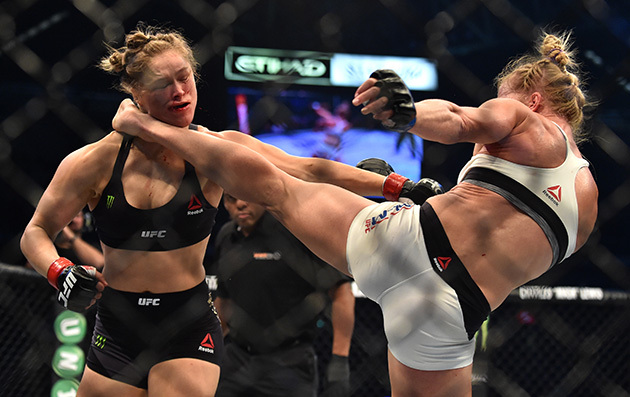 But the thinking here is that Holm is blossoming into a force, her confidence rightfully through the roof. If the champ’s takedown defense is anywhere near as effective as it was against Rousey, this will be her night. Holm by decision. Conor McGregor vs. Nate Diaz, welterweight; Gian Villante vs. Ilir Latifi, light heavyweight; Corey Anderson vs. Tom Lawlor, light heavyweight; Amanda Nunes vs. Valentina Shevchenko, women’s bantamweight. Preliminary card (8 p.m. ET, Fox Sports 1 and Fox Deportes): Brandon Thatch vs. Siyar Bahadurzada, welterweight; Erick Silva vs. Nordine Taleb, welterweight; Vitor Miranda vs. Marcelo Guimaraes, middleweight; Darren Elkins vs. Chas Skelly, featherweight. Online prelims (6:30 p.m., UFC Fight Pass): Diego Sanchez vs. Jim Miller, lightweight; Justin Salas vs. Jason Saggo, lightweight; Julian Erosa vs. Teruto Ishihara, featherweight. Mike Goldberg will handle blow-by-blow and Joe Rogan analysis for the main-card telecast on pay-per-view as well as prelims on Fox Sports 1 and the UFC Fight Pass. There will be an hour-long postfight show on Fox Sports 1, starting at 1:30 a.m. ET.